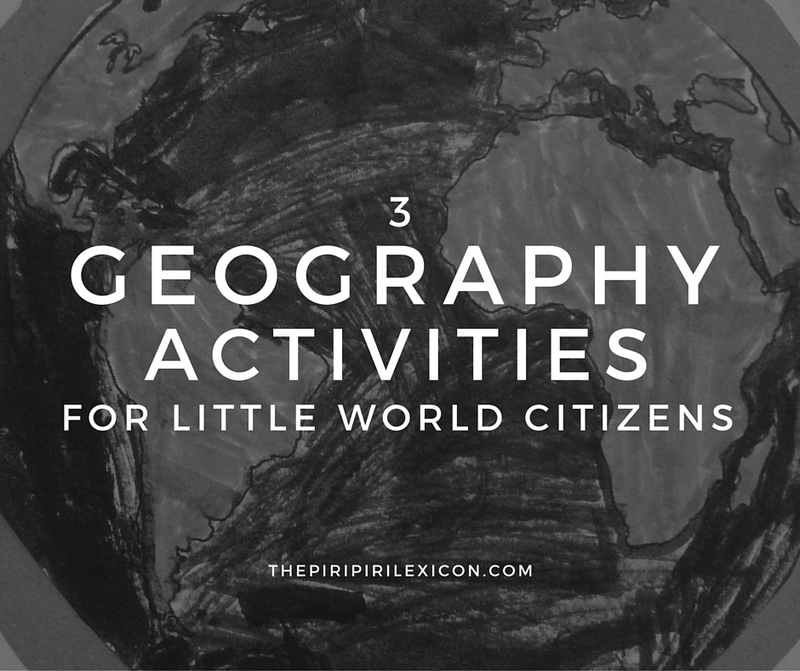 This past year, LJ, 6, and I have been trying to spend to do a few activities focusing on learning about world geography. I say trying, because we a 2-year-old in tow, it is sometimes a challenge. Here are some of her/our favourite ones. These are all tried and tested and we have done them several times just because we love them. 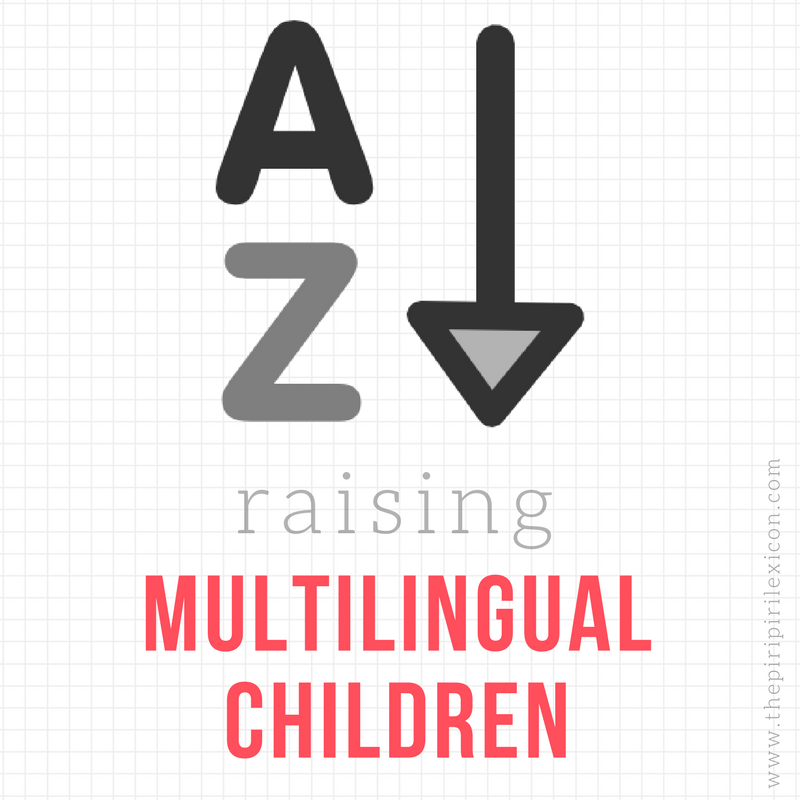 They are suitable from kindergarten age but can be adapted very easily to any other age group. We own a very large cheap paper world map that was meant to go on a wall at some point but we never got round to putting it up. So, we have decided to use it for looking at the world and like to pull it out when the time comes. Most of these activities were done while looking at this map. On a rainy winter day, we decided to adapt this activity we found at Mama Smiles. We got a stack of post-it notes, a weather app on my phone and off we went. LJ picked places in the world that she was interested in and I looked up the weather. She then wrote the temperature and did a little drawing to represent the weather. In the interest of making the activity more challenging and exciting, I also picked a few destinations I knew would have more varied weather. Numeracy and geography all rolled into one. Great fun. Again, with the same illustrated map, I got our huge jar of foreign currency and started sorting. I selected two types of coins. First of all, some Euros (our own currency) because they are recognisable and because I want her to familiarise herself with them. And second of all, some foreign coins picked for their originality (different scripts, countries she has been to, countries where the names are easy to read, coins with holes in, etc). We did two things with these coins. 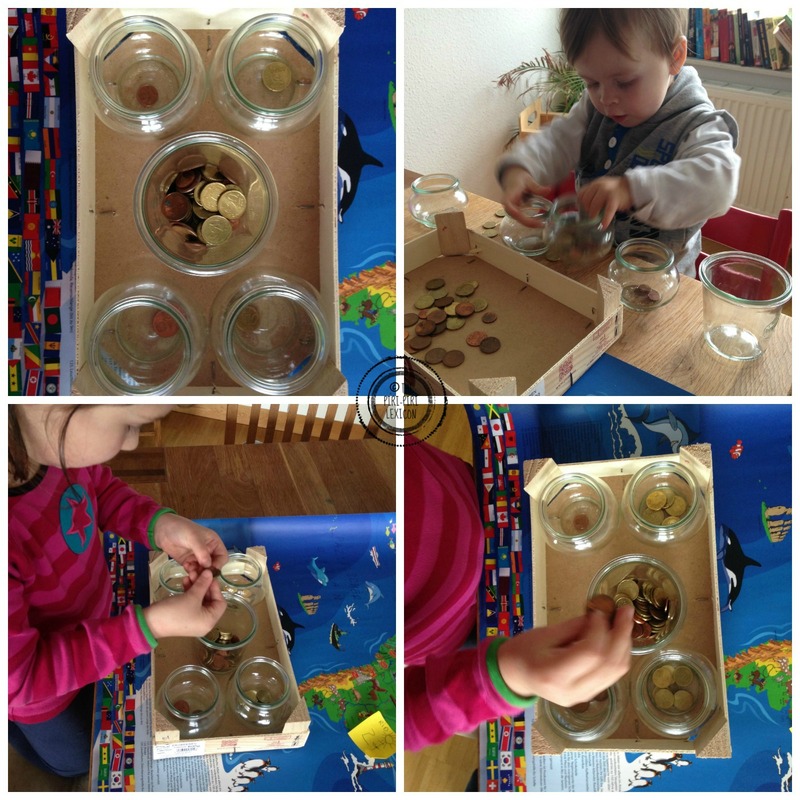 First, we spent a short amount of time sorting the coins (Montessori-style). This was easy for a 6-year-old. It can be done with much younger children. But she loved looking at the coins. And the aim was for her to familiarise herself with the sizes and colours. By the end, she didn't need to read the numbers anymore to know what they were. E, 2, loved this too as he enjoyed the sounds of the coins in the glass jars (yes, I gave him glass jars to play with - no, he didn't break any). This was inspired by this article. Then, we moved on to the second set of coins and LJ tried to guess or find out what countries the different coins came from and placed them on the map. She really amazed me doing this. She guessed many rightly and made deductions that were pretty awesome. 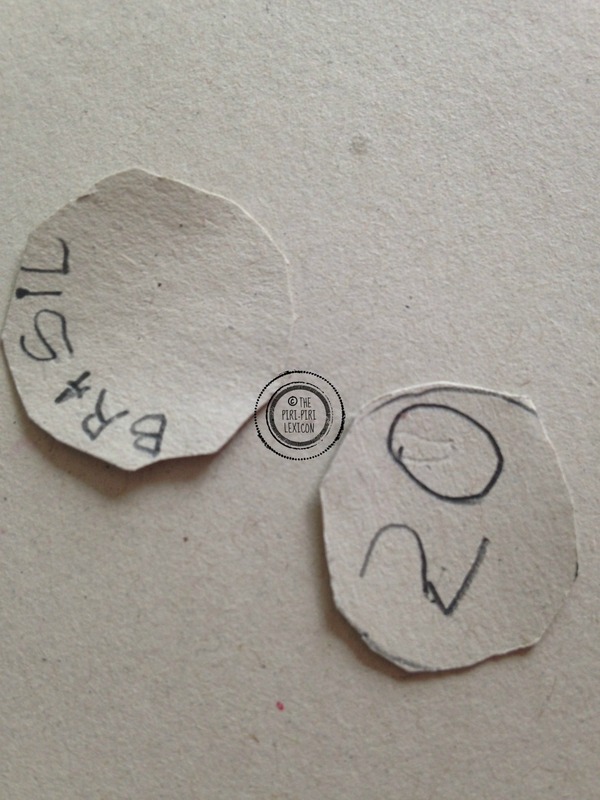 Finally, because she loves crafting, she decided to create her own coins. We talked about what information was on each coin. She added names, numbers and then went on to draw little symbols. I let her be totally creative and backed out of this. 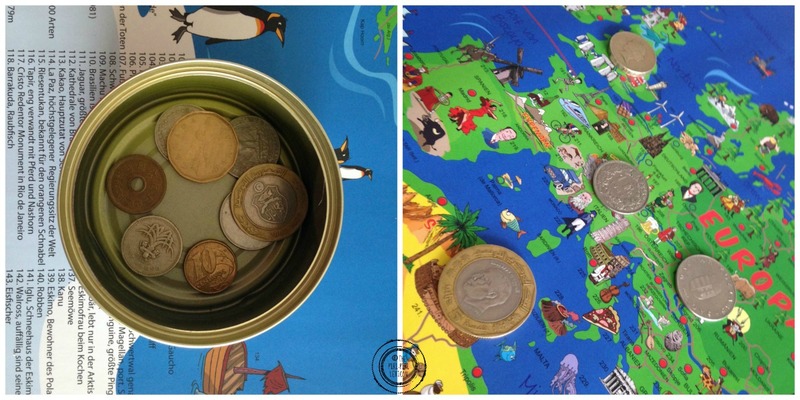 So many skills in playing with these coins: literacy, numeracy, geography and world knowledge at the very least. 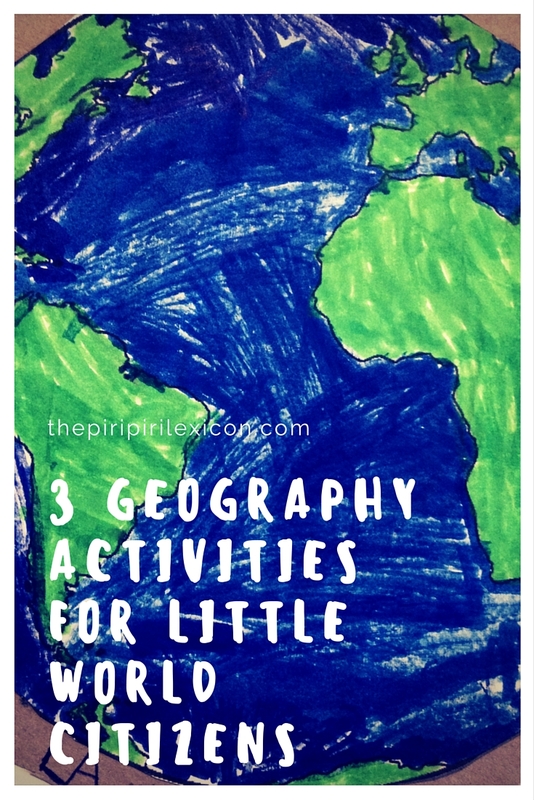 Our third activity was born out of the need to be able to explain to LJ that we may live in Germany and Papa may come from Portugal but these countries are within Europe while the USA, where we spent our holidays, is on another continent. Explaining those geographical terms was tough. I found the perfect activity to do it. And she got it straight away. Fresh from our trip, where we learnt about the earth, crossing oceans, etc, I am trying to introduce new concepts like continents. It is important to us as a family, that our 6yo understands what Europe is since we come from different countries within Europe and use that word often. This activity was a perfect fit. It put all these words into context (planet, continent, country, city) and she got it straight away. Proud of my little geographer. Credit due to @kidworldcitizen for the activity. She found the whole thing a little long though. So we did it in two times. I have to also say that two months on from this, she still proudly shows this to anyone coming to our house and she remembers and understands everything. 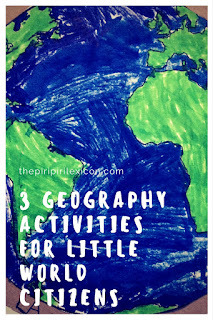 Bonus activity: We also love this little printable to learn and name all of the continents.